This Italian dessert is one of my favorite things to eat. Of course, there is no coincidence that it is basically a culinary cousin to one of my other favorite foods: ice cream. The two share similar cooking methods: a milk and cream base is cooked and flavored, then chilled before serving. 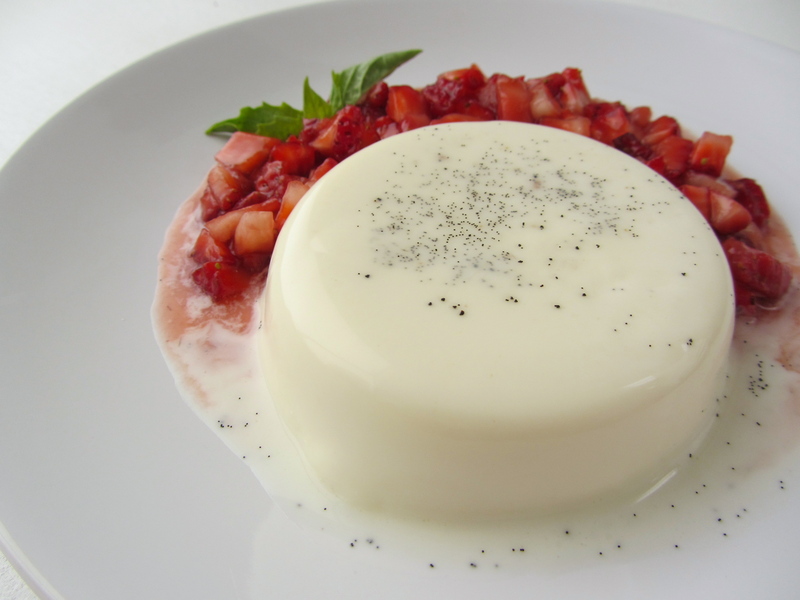 In the case of the Panna Cotta, I find it packs a larger mouthful of flavor when compared to its frozen cousin; since it is chilled, not frozen, the subtle flavors of cream, vanilla, and whatever else you may add to it, really come out to play on the taste buds. 2. In a small saucepan, combine the cream, milk, sugar, vanilla seeds, vanilla pod, and salt. Bring to a boil, then reduce heat and simmer for one minute. Stir mixture constantly to prevent it from boiling over. Remove from heat. 3. Mix in gelatin, gently stirring for one minute to ensure it is thoroughly dissolved into cream mixture. 5. At least half an hour before serving, macerate the strawberries: stir the brown sugar into the berries, let stand for at least 30 minutes. 6. When ready to serve, to remove the panna cotta: run a paring knife around the side of each ramekin, then quickly dip them into boiling water. The panna cotta should now be separated from the ramekin when lightly pressed on. Invert them out onto serving plates and serve with the macerated strawberries. * For more layers of flavor: drop in a few stars of anise into the cooking cream and/or add a splash of fruit-flavored liquor into the berries while they macerate.